Local search is an increasingly important step in the customer journey and can grow a company’s online influence of potential customers. Local search represents 35% of all organic traffic, according to new research by ReviewTrackers. But despite the amount of local searches that take place, 58% of businesses still don’t optimize for local SEO. Here’s how to make sure you don’t make that mistake. Imagine you are searching for a moving company in Chicago. You type “moving companies” in the search bar and see three Chicago-based businesses in Google’s local pack. After checking out each of their reviews and ratings, you make your decision: You’re going with the mover with the most reviews, reviews the manager responds to, and a 4.4-star rating. You’ve just performed a “local search,” something that wasn’t even possible until Google began to incorporate local businesses into its search engine in 2010. Local search is a key step for consumers when they research a business. It is when a search engine provides business options near the person who is searching in an effort to find local services that will meet their needs. Why Is It Important for Businesses to Pay Attention to Local Search? More than half (53%) of searchers typically visit a business within 48 hours of a search. More than one-third (36%) of searchers visit a business within 24 hours. About 17% of searchers visit a business immediately. 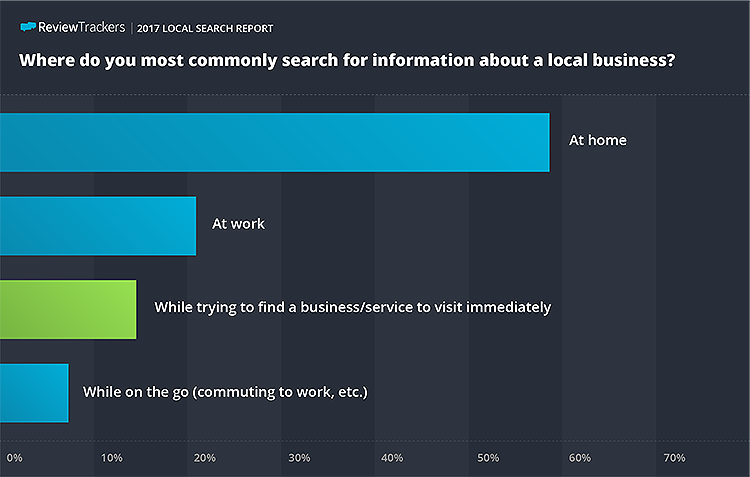 More than half of consumers research local businesses at home, and more than 20% search at work. About 17% of consumers also search for local businesses when they need a service immediately. The millennial generation is more likely to visit a local business after a local search than older generations, according to research by ReviewTrackers. In addition, 42% of millennials performing a local search visit the resulting business most of the time. As millennials become America’s largest generation, it is important for companies to appeal to them through local search, which can increase profits and visibility. Because consumers increasingly use local search when looking for a business, businesses should make local search optimization a priority. To make the most of local search, you should manage local listings and online reviews and include pictures in your review profiles. Every local listing you have online increases your chances of being found in organic searches, according to Moz. Your listings can be found on websites such as Facebook, Yellow Pages, Citysearch, and Google My Business. The keywords found in local listings send signals to Google to help you rank higher in local search. When you create a new local listing, it’s important to have consistent and up-to-date information across every website where your business locations are listed. This includes location pages, apps, directories, your website, and other digital properties. It is also important to build out your listings; more than half of consumers want to see your address, phone number, hours of operation, website, and prices when conducting a local search. Consumers want to learn about your business in detail. Reviews play a large role in contributing to local search performance, accounting for 13% of the local search-ranking factors. According to Google, volume, rating scores of reviews, and responses are all factors in determining a location’s “prominence,” which is one of three parts of local search in addition to relevance and distance. The diversity and quantity of the reviews contribute to where your business lands in local search. When you respond to reviews, customers see that you care about them. The act of responding also shows potential customers that you listen to what your current customers have to say. It’s a way to engage with searchers who, for example, are searching where to go for dinner, and also to engage with current customers. A good response to a review is one that is personalized. The owner uses the name of the reviewer and makes note of her special occasion, which adds a personal touch to the message. Analyze the trends within your online reviews. It’s important to know what your customers are saying and if there are ways you can improve the customer experience. Reviews also reveal hidden issues that you might not have otherwise known. For example, if reviews consistently comment on slow service, that is something you now know to adjust. This can help you satisfy more customers and, therefore, improve your future reviews. The more reviews you have, the more likely your business locations will show up in local search. To achieve this, many businesses ask customers to post reviews about their experience. In addition to improving local search performance, reviews give you a chance to find and win back detractors and also discover customers who enjoy your brand. According to ReviewTrackers research, 24% of consumers say profile pictures are one of the most important factors when considering a local business. Customers want to see photos before they visit a business. Adding photos of your products, services, management team, and employees can give potential customers a better idea about the business. If no one on your team is proficient at photography, you can hire a professional photographer who can help you achieve a flattering and accurate representation of your business. Businesses without images can lose out on local search success, so to engage customers when they are using local search, add images to your review profiles. There are practical steps you can take to make sure your site is optimized for local search. Managing local listings and online reviews and adding pictures to your review profiles can help your business appear front-and-center on online search tools for customers who are ready to buy. 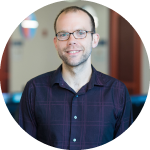 Max Schleicher is the head of content at ReviewTrackers, where he enjoys culling data from online reviews to write about customer behavior and sentiment.